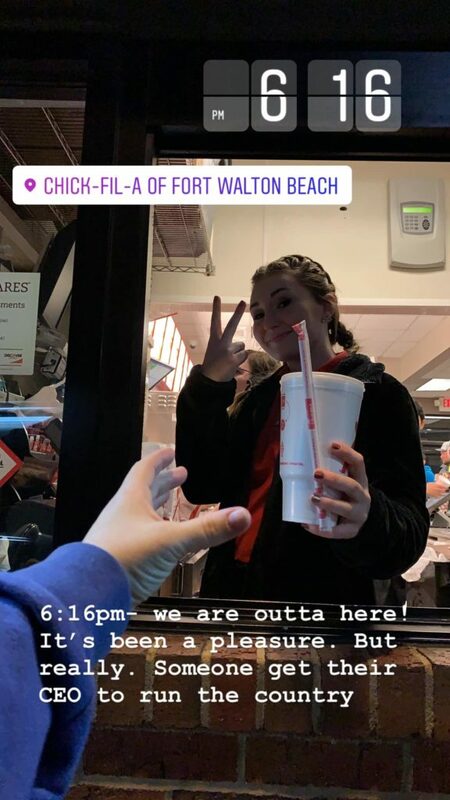 Yesterday, the Chick-fil-a in Fort Walton Beach’s Facebook page dropped some awesome news that they would now be delivering through DoorDash as of next Wednesday. As part of a national contract that Chick-fil-a has with DoorDash, we now get the benefits of having DoorDash in our area. This is HUGE!!!!! This will go LIVE next Wednesday! Download the DOORDASH app and have CFA delivered to your door! 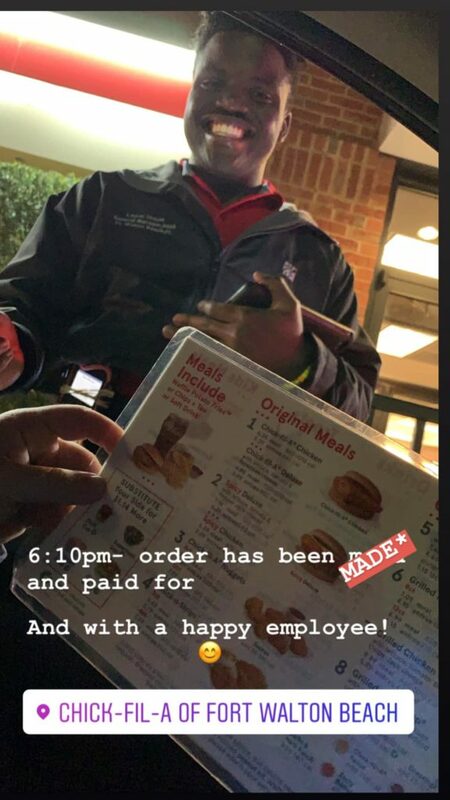 The night of the announcement, my friend Holly Ferris decided to document in a series of IG stories just how great the entire team at CFA really is. 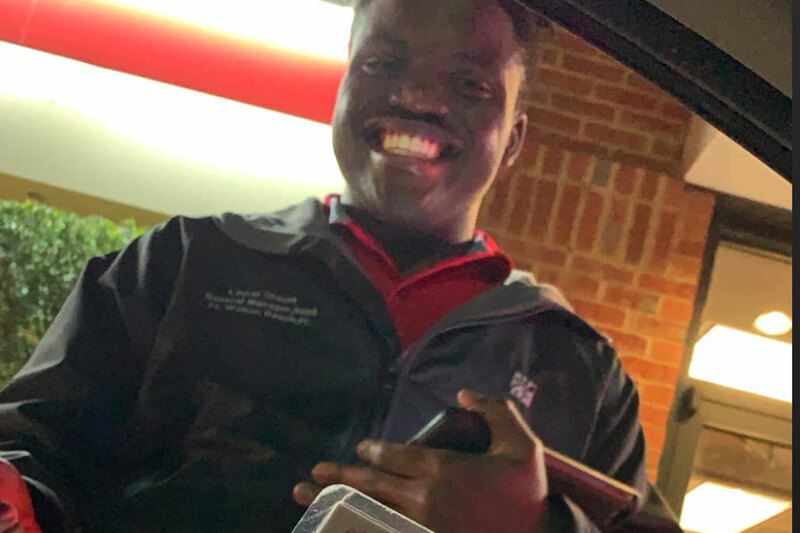 Anyone who frequents our beloved Chick-fil-a knows that you better hit that turn lane to make your access to the drive-thru as easy as possible! This goes for the southbound lane coming down Beal Parkway. Don’t turn onto Lewis Street…you better hit that U-Turn and then get in line! Holly did this…because Holly knows the deal. When we decide to hit CFA up it really doesn’t matter what the line looks like from the road. 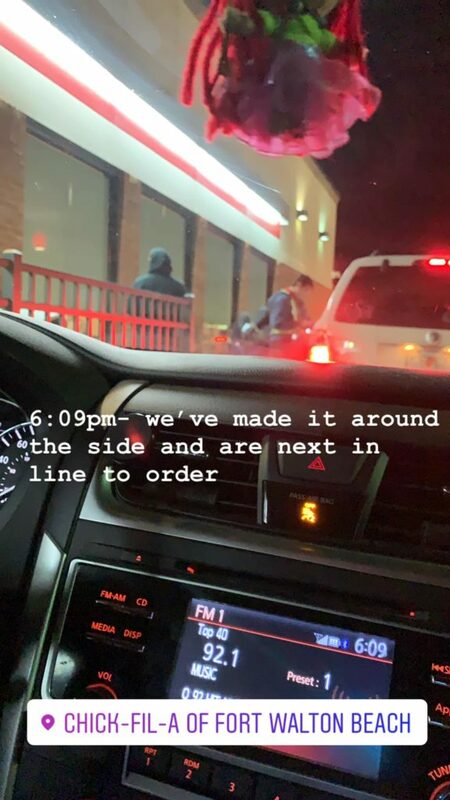 Those living-my-best-life CFA employees standing outside get the line moving! 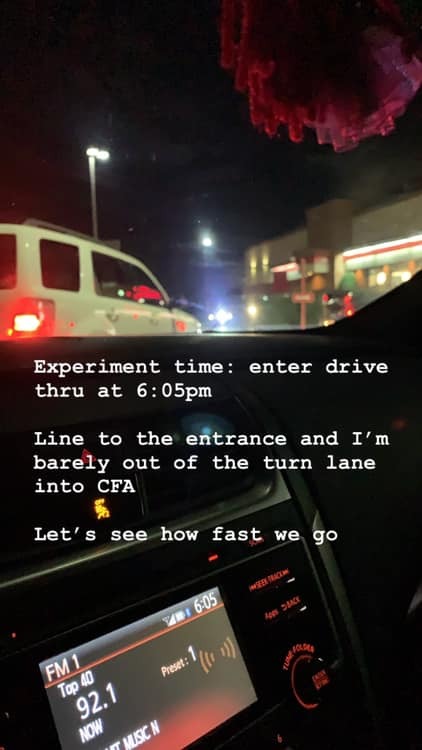 When Chick-fil-a decided to put some employees out in the parking lot to help speed up the drive-thru, I had never seen anything like that before. I wondered just how fast could it be and how it would all work. That’s the last time I ever question a decision by Chick-fil-a! They walk next to your car as you order and get the order processed so fast in their little tablet that it’s almost as if they knew what you were going to order before it ever left your mouth. They also greet people walking up, hold doors open and continuously say your name once they’ve learned it…all while taking your order! Holly ordered her food in 1 minute. In a matter of 6 minutes, Holly was snapping a quick pic and heading out of Chick-fil-a’s parking lot. That’s a total of 11 minutes from the time she entered the turn lane! Here’s why they are the best: I’ve never been to one that runs as smoothly as they do! Not in Okaloosa County or any other city or state that I’ve hit up! On my family’s most recent trip to Austin, TX for Thanksgiving, we stopped at a couple along the Interstate. Every single time we commented and said that while this CFA was good, ours was better!